Nitro Crew is now offering all our customers 6 months interest free finance available on all our products. Just choose your wheels & tyres online or come and get them in one of our stores in Wynnum, Mansfield or Mt Gravatt. Your interest free finance is a couple of steps away. On the next page, please use 1234 for order number. If you need more information, please give us a call at 07 3396 3770 (Wynnum) or 07 3219 3888 (Mansfield). * Credit approved applicants only; fees, terms and conditions apply including a $99 Annual Fee charged on the account open date and subsequently on the anniversary of the account open date. 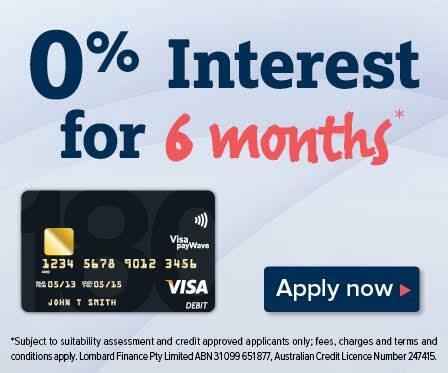 Up to 55 days Interest Free is available on all Lombard 180 card purchases (excluding cash withdrawals), when you pay, by the payment due date, the amount identified in your statement as the ‘optional repayment to qualify for up to 55 days Interest Free on purchases’. 6 months Interest Free is available on all Lombard 180 card purchases of $250 or more made in one transaction. Interest, currently 22.99% p.a., is payable on balance outstanding after any Interest Free term. Credit provided by Lombard Finance Pty Ltd ABN 31 099 651 877 Australian Credit Licence number 247415 (Lombard). Lombard® is a trademark of Lombard. Lombard is a subsidiary of FlexiGroup Limited.